Abdurrahman Shalgham was one of Colonel Gaddafi's oldest friends and political allies before publicly and emotionally denouncing him to join the rebellion in Libya. In an interview with HARDtalk's Zeinab Badawi, Mr Shalgham said the defected Libyan foreign minister Moussa Koussa cannot leave the UK because he is under arrest. British Foreign Secretary William Hague told the BBC's Andrew Marr Show on Sunday that Mr Koussa was not under arrest, but that he was in a secure location. You can watch the full interview on BBC World News on Wednesday 6th April 2011 at 0330, 0830, 1530, and 2030 GMT and on BBC News Channel at 0030 and 0430 BST. 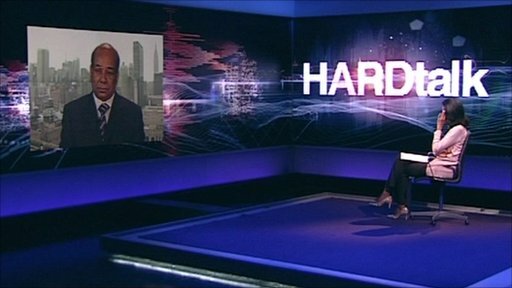 Follow HARDtalk on Twitter to find out who is coming up on the programme.